One of the most important factors in Maxtop Quartz’s superior status in the world of worktops is that it provides the best of both worlds. As an installer, your customers enjoy the stunning beauty and strength of a solid quartz surface, whilst you benefit from the fact that it’s quicker and easier to install than traditional solid stone surfaces. Of course, the process of installation is crucial, so we’ve rounded up our video content, which highlights just how simple it is to fit and also provides a few tips and tricks if you’ve got a Maxtop job coming up. Meet Ian, our specialist Maxtop Quartz installer. Want to know exactly what you’ll be learning on the Maxtop Quartz installation courses? Here’s an overview to give you a taste of exactly what to expect from one of our training courses. 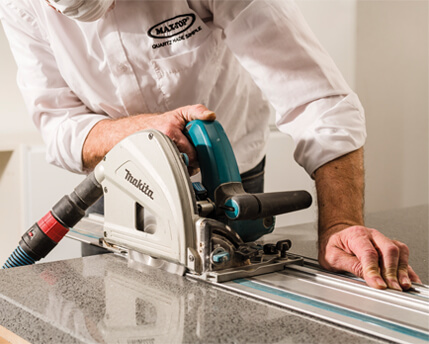 Finally, take a look at the following video for some in depth tool tips and a demonstration on how to re-edge a Maxtop Quartz worktop. So, if you want to install worktops that finish any kitchen off beautifully, save yourself a job and choose the surface that acts like solid quartz but fits like laminate. Take your training to the max with one of our training courses. Contact us here, or on Facebook or Twitter.